Reserve cheap car rental by completing the search form! Visit places of outstanding natural beauty with car rental Luton! Car rental Luton offers you extensive range of car rental deals to suit your car hire budget. Whether you’re looking for an upmarket luxury car or just want a comfortable vehicle for family travel we are able to provide you with a car rental to suit every occasion! Car rental Luton is the best way to enjoy dedicated customer service and make your trip a memorable event! Choose the suitable Luton car rental location and look through Must Know and Places to Visit with car rental Luton! 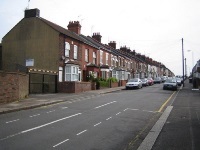 Luton is the city in the south-east of London located on the River Lea in the county of Bedfordshire. The town's history dates from the 6th century when a Saxon outpost was founded here. Now being a thriving industrial, commercial and retail centre, many of the town's older buildings have been lost but those of particular historical interest include the 12th-century St. Mary's Church. You will find good leisure and entertainment facilities and some notable visitor attractions in the vicinity. Prepare to drive on the left-hand side of the road. Don’t drive in lanes reserved for buses and taxis, unless neces­sary to avoid a stationary vehicle or obstruction, and give priority to authorised users. Always approach pedestrian crossings with caution and don’t park or overtake another vehicle on the approach to a crossing, marked by a double line of studs or zigzag lines. 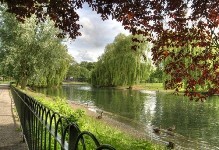 Visit a true jewel among Luton’s parks by your car rental Luton. The park has outstanding features, such as the fountain and boating lake, and a rich history. It is one of seven district parks in Luton, providing a green refuge within walking distance of the town centre. The park provides the setting for Wardown Park Museum and offers a wide range of opportunities for formal and informal recreational activities. See what life was like in pre-industrial Bedfordshire by visiting the Stockwood Discovery Centre by your car rental vehicle. 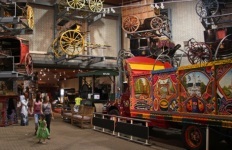 The craft museum has displays on Bedfordshire rural life, crafts and trades and regularly enhanced trade demonstrations. The Mossman collection gives visitors a look at horse-drawn vehicles, the largest collection of its kind on public display in Britain. 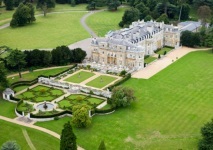 Being located only 2.27 miles from the city – Luton Hoo is extremely accessible with your car rental vehicle. 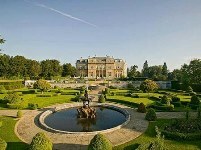 Luton Hoo is a palatial mansion, which was originally designed in 1767 by Robert Adam for the third Earl of Bute. If you are looking for a quiet country retreat away from the city, a peaceful working environment for your employees, or fulfilling your sporting interests Luton Hoo Estate has something to offer. Someries Castle lies just south of Luton and you may come here using your car rental Luton. It was built in the 15th century by Sir John Wenlock. What remains is in ruins but will allow you to imagine how it must have looked in its prime. 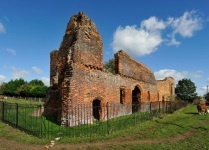 The remaining brick building is the gatehouse to the actual manor house. All that remains of the manor house is the clearly visible earthworks that outline the plot where once the house would have stood. RentalCars24h.com offers you reliable car rental Luton services that will help you to feel free and independent when moving around the town. Providing best online prices for car hire Luton services, RentalCars24h.com allows you to save money each time when you rent a car in Luton.